[Limpkin] designs circuits for a living. This board is one of his recent projects, and although his skills are light years ahead of our own experiences, he did a pretty good job of explaining how he put this board together. He was tasked with measuring the light intensity of two photodiodes. The expected impulses picked up by those components will be less than a nanosecond in duration, putting some special design constraints upon him. To register this signal he’s using three cascading op-amps per input. To ward off false readings from RF interference he also designed in the shielding which you see surrounding the majority of the circuit. His package choice for the THS3202 op-amps is quite interesting. He didn’t go with the footprint that includes a thermal pad to dissipate heat because he didn’t want to interrupt the ground plane on the underside of the board. To keep the parts from melting he added an aluminum spacer that contacts the top of the package, then a heat sink that covers the entire shield frame. In a future revision he figures he’ll move to a four-layer board so that the can opt for the MSOP package that does the work for him. Lots of people build custom steampunk goggles, but most don’t implement any interactivity – they’re just an aesthetic accessory. [Sarah] recently decided to built a pair that, besides looking cool, would engage the wearer in creating sound. She accomplished this by integrating an optical theremin into their design. To keep the build both affordable and wearable she researched simplified theremins, and eventually settled on creating a basic model that uses only a handful of components and two 555 timers. 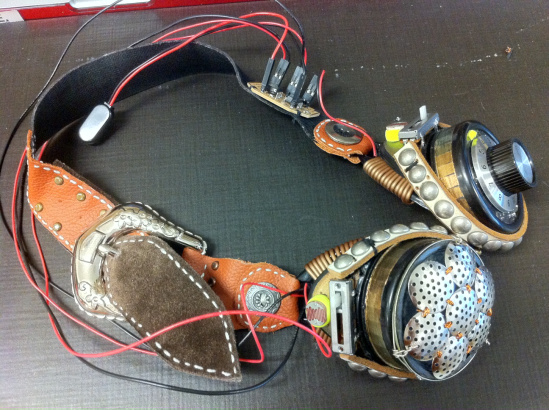 The main body of the goggles was constructed using mostly random mismatched pieces of metal and leather. Mounted on the outer edge of each lens, there is a photo sensor and a corresponding slider control. Adjusting the slider alters the level of resistance, therein changing the pitch of the sound. The theremin will produce different pitches and octaves depending on how much light the sensors receive. So, the wearer, or a nearby friend, waves their hands around the wearers head to control it. The speaker and volume knob are cleverly disguised as the two ‘lenses’. Rotating the volume knob lens adjusts an internal potentiometer that’s held in place by a custom laser etched piece of acrylic. To top it all off, she even designed her own PCB using Eagle. Check out a video demonstration after the break. After going through the original quick list we tossed together, people were chiming in like crazy. We felt another 10 might help satiate the desire to smirk at the silliness of tech portrayed in movies and TV. Gathering examples from your comments, we have compiled part 2. While I would have loved to narrow this down to a specific item like incorrect lingo or screen grabs, I didn’t quite have enough specific scenes to do it yet. Be sure to keep the comments coming and be specific, I haven’t seen many of these till someone points it out. If you want to do casting at home, you’ll need a way to melt metal. [Jake]’s DIY foundry furnace gets hot enough to melt aluminium, and is built out a mix of scrap parts. The chamber of the furnace is built out of a water heater tank which has been lined with a special cement that refracts heat. The furnace is heated by a Babington burner. This type of burner works by atomizing the fuel and injecting it into the furnace. They are good for burning waste oil to achieve high heats. A scrap Volkswagen oil pump and a cordless drill are used to feed oil into the burner. Once it’s fired up, the furnace takes about 10 minutes to melt the 11 pounds of metal that it can hold. [Jake] melted about 40 pounds of aluminium alloy from scrap alloy wheels in 2 hours, which should be more than enough for a home casting project. After the break, check out the overview of the device and a demo of melting aluminium. When brewing your own beer, temperature control is important. If the temperature isn’t regulated correctly, the yeast will be killed when it’s added to the wort. It’s best to cool the wort from boiling down to about 25 C quickly before adding yeast. To do this, [Kalle] came up with a wireless temperature controller for his home brewing setup. The device uses a heat exchanger to cool the wort. An ATmega88 connected to a H-bridge controls a valve that regulates flow through the heat exchanger. It reads the current temperature from a LM35 temperature sensor and actuates the valve to bring the wort to a set point. A neat addition to the build is a wireless radio. The nRF24L01 module provides a wireless link to a computer. There’s an Android application which communicates with the computer, providing monitoring of the temperatures and control over the set point from anywhere [Kalle] can get an internet connection. We’ve seen [Todd Harrison]’s work a few times before, but he’s never involved his son so throughly before. This past Easter, he thought it would be a good idea for his son and a few of his friends to take part in an easter egg hunt. Being the ham he is, he decided to turn an easter egg hunt into an adventure in radio direction finding, or as amateur radio operators call it, a fox hunt. [Todd] put together a great tutorial on building a yagi – a simple directional antenna – out of a couple of pieces of PVC pipe and a few aluminum and brass rods. With this and a handheld ham set, [Todd] hid a fox along with a stuffed easter bunny and a basket of candy near a local park. Operating under the guidance of his dad, [Todd]’s son and his friends were eventually able to find the fox. Leaving candy out in the Arizona sun probably wasn’t [Todd]’s best idea – the fox, and candy, were covered in ants when they were found – but it was a great introduction to amateur radio.